Finally I made it to this restaurant! 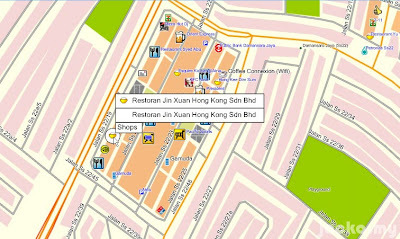 Jin Xuan Hong Kong Restaurant 锦选香港特级点心. I've been passing this restaurant for many times, twice last week. It's every time that there's no "chance" to turn in to have a meal or the restaurant was terribly crowded. My cousin has been recommending this restaurant too. This cousin has the same high expectation on non-halal dim sum like me (I miss East Ocean Restaurant in Singapore! ), so I am confident that his recommendation can't go wrong. Hehe... Kiasu bugger. The fried dimsum (top) on my right and the cart for steamed dimsum (below) was in front of me. Also you can see a big kitchen, to prepare your order. According to my cousin, depending on the crowd, some times they do not push the cart around but customers have to order the steamed dimsum and have the kitchen to prepare. I waited no more, I ticked ticked ticked on the order sheet and +/- 10 minutes my order was served. Tasty! Most of the restaurants in Klang Valley cheat customers by stuffing only pork meat into the dumplings without shrimp or scallop or whatever should be in the dumpling. Here you really get shrimp and scallop in the dumplings, and the size is big. Yummy! Po loh pao 菠萝包 (pineapple bun) but in fact it's a custard bun. This one not good. Ah! Now I miss KK's pineapple bun! It can be found in the latest MFM map, or Jalan SS22/19 or GPS coordinate N3 07.606 E101 36.928.